Etching is something you can spend your lifetime learning about. Color spit bite aquatint with flat bite and soft ground and hard ground etching printed on gampi paper chine collé. Image size: 20 x 25"; paper size: 26½ x 31". Edition 20. Color spit bite aquatint with flat bite, hard ground and soft ground etching, and drypoint printed on gampi paper chine collé. Kiki Smith’s 2003-04 print retrospective at the Museum of Modern Art in New York, Prints, Books and Things, showcased the scope of her printed art. Her 2006 retrospective of more than two hundred works, Kiki Smith: A Gathering, opened at the Walker Art Center in Minneapolis and traveled to the Contemporary Arts Museum in Houston, the San Francisco Museum of Modern Art, and the Whitney Museum of American Art in New York. Smith participated three times in the Whitney Biennial and five times at the Venice Biennale, including the 2017 edition. She is a member of the American Academy of Arts and Letters and the American Academy of Arts and Sciences, and in 2017 was awarded the title of Honorary Royal Academician by the Royal Academy of Arts, London and a Lifetime Achievement in Contemporary Sculpture from the International Sculpture Center, New Jersey. Other awards include the Skowhegan Medal for Sculpture in 2000; the 2006 Athena Award for Excellence in Printmaking, Rhode Island School of Design; the 2009 Edward MacDowell Medal; the 2010 Nelson A. Rockefeller Award, Purchase College School of the Arts; the 2013 U.S. Department of State Medal of Arts, conferred by Hillary Clinton; and the 2016 Lifetime Achievement Award from the International Sculpture Center, among others. Smith is an adjunct professor at Columbia University and New York University. She has taught printmaking courses on and off at both schools since 1998. Smith has been represented by Pace Gallery in New York since 1994. 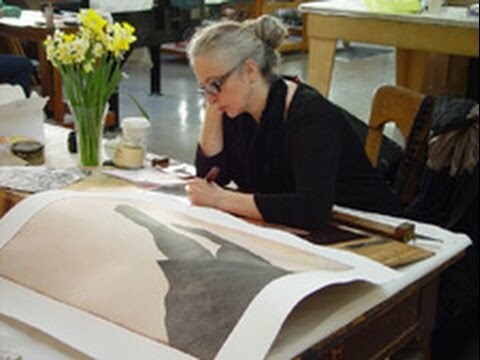 Artist Kiki Smith discusses making an etching at Crown Point Press in San Francisco.